Fabric glue has become a valuable commodity in my quilting studio. With the advent of the Apliquick method for turned-edge appliqué, fabric glue is used to hold the turned seam allowance in place before sewing. 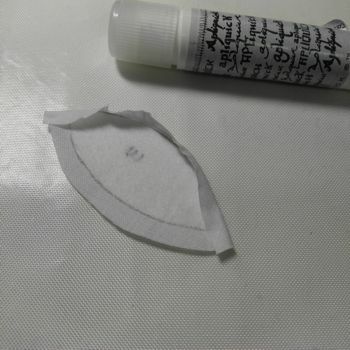 Fabric glue is essential for preparing shapes for English Paper Piecing, whether basting to paper or precut iron-on interfacing. And it sure comes in handy for securing the lining to light-colored appliqué patches or tacking shapes onto a background before machine stitching. 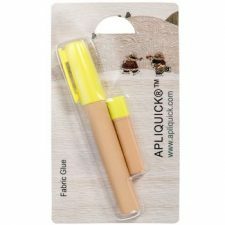 The original Apliquick glue came in a handy pen-like shape with one glue refill cartridge. The glue went on yellow (or blue) and dried clear in minutes. 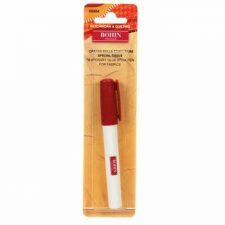 Other brands of glue – such as Bohin, Fons & Porter, and Sewline – use the same format of glue pen, making the refill cartridges interchangeable from one to the next. 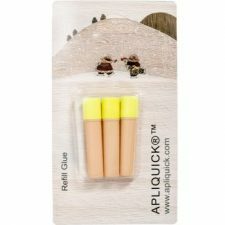 Apliquick has now discontinued this glue, replacing it with an all-new product. The new Apliquick glue has a wider diameter, is transparent in color and is not refillable. It will be available at the end of April 2017. In the meantime, we have been using Bohin glue. 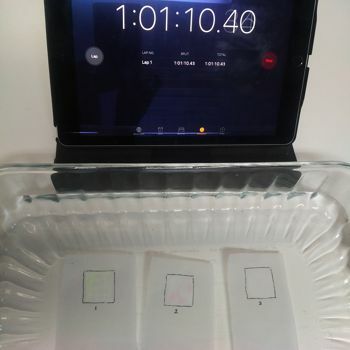 It has the same profile as the original Apliquick glue – the only observable difference is that the glue color is pink. 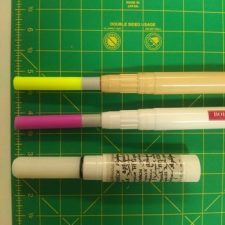 So how do these glue sticks compare? Which one will you use? *Always replace the glue cap between uses. Prolonged exposure to air will alter the glue’s consistency. **No discernible scent during use. Faint scent detected when glue held directly under the nose. Hand sewing No discernible difference while hand sewing. 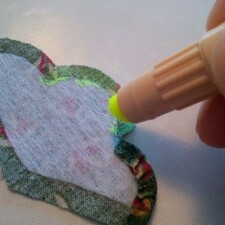 The needle passes easily through the glue in the fabric. Grip is defined as the ability for the glue to hold the fabric in place without lifting. My initial tests with the Apliquick clear glue were disappointing as I frequently experienced the fabric lifting and struggled to establish a firm bond. The transparency of the glue could be a factor – without being able to see where the glue had been applied, perhaps some sections had been missed. Because of the larger applicator tip on the Apliquick clear glue, I observed that more glue was landing off the fabric and onto the gluing surface. To correct this, I moved the glue tip so that the glue would land partly on the seam allowance and partly on the interfacing. The result of this was less waste and better grip! It appears that glue on glue creates a better bond with this product. Solubility is defined as the ability for a substance to dissolve. 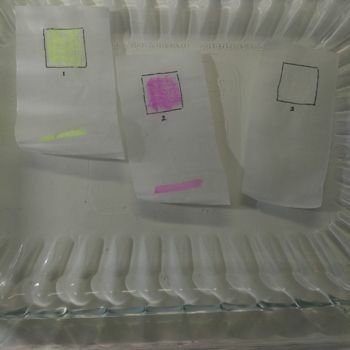 All three glue samples (1=original Apliquick glue; 2=Bohin glue; 3=Apliquick clear glue) dissolve in water, but the colored glues have a disconcerting characteristic: the glue color reappears when the fabric gets wet. After an hour soaking in water however, the color is almost gone. And after soaking overnight, the color is completely gone. There is more than twice as much glue in the new Apliquick clear glue sticks than in the Bohin and original Apliquick glue pens (4.52 cm3 vs 1.54 cm3). But how long does it last? To test this, I counted how many 2-inch clamshells I could prepare using each glue stick. The results surprised me. My first guess would have been that the new Apliquick clear glue would last the longest. But then as I used it, I realized that the larger tip meant that I was actually applying a larger diameter of glue to the fabric surface. 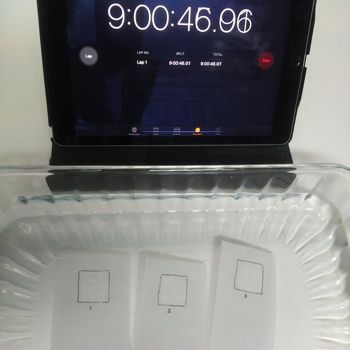 This led to my second guess that all three glue samples would yield approximately the same number of clamshells, since they all have the same length of 4 cm of glue in their cylinders. In actual fact, the new Apliquick clear glue yielded the least number of clamshells at 118. Bohin came second at 136 and the original Apliquick glue yielded a whopping 154 clamshells. How do we explain this? I think it comes down to color. Because of the transparency of the Apliquick clear glue, we can’t see where we’ve applied it or how much we’ve used. I may also have used more of this glue to combat the issues I was experiencing with the grip. 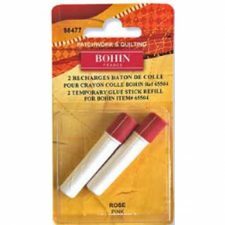 As for the difference between the two colored glues, the Bohin product is a soft pink that doesn’t stand out as brightly and appears to dry more quickly than the bright yellow of the original Apliquick glue. This again may have caused me to apply more pink glue to the fabric surface than yellow glue. The new Apliquick clear glue has some wonderful attributes. Its softer consistency means that the glue glides effortlessly across the surface of the fabric. The longer drying time is significant. You will have more time to work with your shape, perfecting the smooth turned edge, before the glue dries. Then once the glue is dry, the fabric feels almost as soft and pliable as it did before you applied the glue. 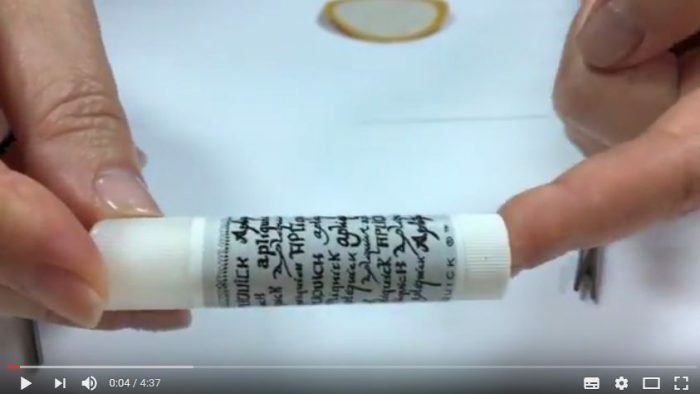 You will achieve excellent results using this glue for the Apliquick method for turned-edge appliqué or for preparing your shapes for English Paper Piecing. 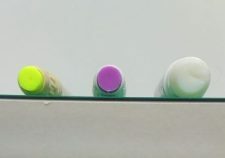 The attributes it lacks are the smaller diameter glue tip, the color for easy visibility (which appears to contribute to how long it lasts), and the refill-ability. If these features are important to you, the Bohin glue is a very close equivalent to the original Apliquick glue. 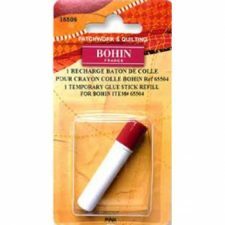 If you have been using the original Apliquick glue pen, the Bohin glue cartridges will fit and can be used to refill it. Below is a video by Apliquick creator Rosa Rojas presenting the new Apliquick clear glue. Let us know what you think! Thank you for this very helpful and informative review. I bought the Appliquick tools and glue (new type) at the last quilt show and have watched the video of Rosa applying the glue. When I tried it, I was totally surprised that my fabric would not easily adhere like it did for her. Then I applied it on the edge of the stabilizer as well and the fabric stuck a bit more easily. Perhaps that’s why her product is a wider diameter…maybe that’s what we’re meant to do. My favorite feature: I like that it comes out with very little pressure, but you go through a LOT of glue. I might try one of the other brands, but I liked the Appliquick…once I got it to work. Patience is required for drying time! Which allows plenty of time to make adjustments. Her tools have given me the confidence to learn applique, and I’ll persevere even if I have to try other glues. I’ve noticed on the video that she uses her glue “liberally”; maybe that’s the secret. Thanks again for this very helpful post! 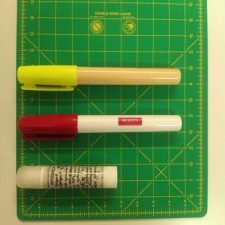 I have used and loved the Apliquick tools for several years, but have always used the refillable pen, because I liked it and bought lots of refills while they were still available. I was doing a demo of the tools in a class I was teaching today, and several students were impressed with the demo and immediately purchased the tools to use on their class project. They had to buy the glue sticks since the pens are gone. It was a disaster. The glue would not hold the fabric at all. The only way to get it to hold was to take the iron to it. That defeats the whole purpose. Needless to say, no one else purchased the tools. I hope Rosa gets the message and fixes this issue! thanks for a great review of glue sticks. 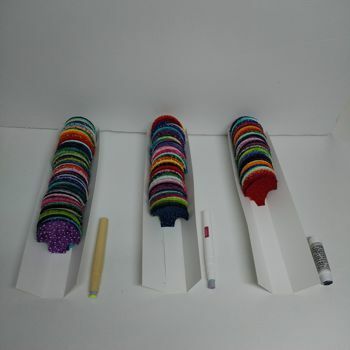 I used Elmer’s Glue sticks too and find they work very well if you are careful because they are so large. I’m disappointed that Appliquick does not refill. We have enough plastic in our landfills. Thank you for all the time you’ve put into this comparison. There certainly are options. That is one thorough review of glue sticks! Wow, What a fantastic review. Thank you.